After being members of Satanico's Los Infernales, Averno & Mephisto turned on him, eventually forming a rudo stable with the former Safari/Hombre Sin Nombre, Ephesto. They called the group La Triada del Terror and were allies of Los Perros del Mal. When Averno and Mephisto won the CMLL World Tag Team Championship from Atlantis and Ultimo Guerrero in February of 2008, Perro Aguayo Jr. formally invited the team to join Los Perros as members. They accepted, causing Hector Garza to leave the Perro and La Triada to be in a state of uncertainty since Epehsto was not invited to join. 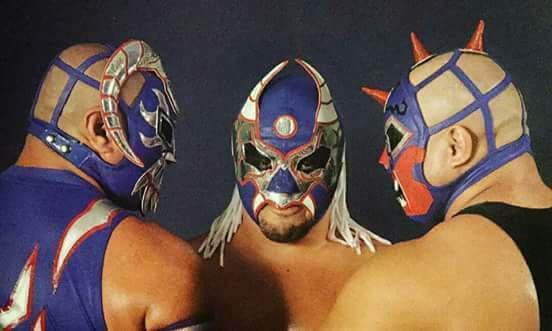 While Averno and Mephisto were members of Los Perros, Ephesto also joined Ultimo Guerrero's Los Laguneros. This page was last edited on 25 May 2017, at 20:48.